Can any parent fail to be drawn to a book subtitled ‘Everything Parents Need to Know’? With the pressure to be perfect, the promise of ultimate knowledge packed neatly into 240 pages is even more appealing than a child-free weekend lie-in. Liat Hughes Joshi’s book addresses the key challenges that parents of primary school children face, from playground friendships and behaviour to homework and pocket money. It provides practical, common-sense advice and avoids, unlike some parenting ‘manuals’, the temptation to preach. As the author says: “Sometimes there’s more than one approach to an issue … as all families are different”. The author, a journalist and mother, is assisted in the book by two child psychologists. There is enough formal psychology to be interesting but not so much as to scare away parents looking for quick, accessible tips they can use every day. The trickier issues it covers, for example bullying, make for unsettling reading but, as any parent with crayons and paper supplies in their bag knows, forewarned is forearmed. Hughes Joshi’s realism and humour throughout the book are a godsend for any parent bashing their head against a brick wall. She acknowledges, for example, that kids would rather be “boiling their own head” than do homework. She also utilises the expertise of those at the coal face – real-life parents. Over 400 were surveyed, the results of which are included in the book as invaluable ‘Parent Panel’ tips. Few things make a parent feel better than knowing others have been through the same and survived. If you’re looking for reassurance that what your kids are “up to (probably) is normal and that you (probably) aren’t rubbish parents who are getting it all wrong” then you’ll find it here. Set down the medicinal wine bottle and pick up this book. 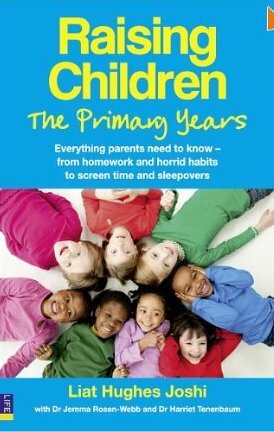 Raising Children: the Primary Years: Everything Parents Need to Know – from Homework and Horrid Habits to Screentime and Sleepovers by Liat Hughes Joshi, Pearson Life, paperback, RRP £10.99 (Kindle, £5.66).